I have been making kombucha for a couple of years now, and I love that I always have some on hand whenever I want a refreshing drink and a good boost of probiotics. If you know me, you probably know I am a big proponent of probiotics, especially from fermented foods like kombucha, kefir, sauerkraut, kimchi, pickles, etc. Good bacteria is essential to our health. Did you know that 70-80% of our immune system is located in our gut? That’s pretty huge! Even more of a reason to be mindful of what we are putting into our bodies. Probiotics, or good bacteria, kill off bad bacteria that are hanging out in our intestine, which leads to a more balanced gut, and in turn a stronger immune system. Probiotics have also been shown to decrease inflammation in the body (think arthritis, asthma, Chrohn’s disease). What’s really interesting to me is how a woman’s gut health during pregnancy and birth can influence the health of her child. All the more reason to drink up this fizzy drink! Out of all the ferments I make, I think Kombucha is the easiest. 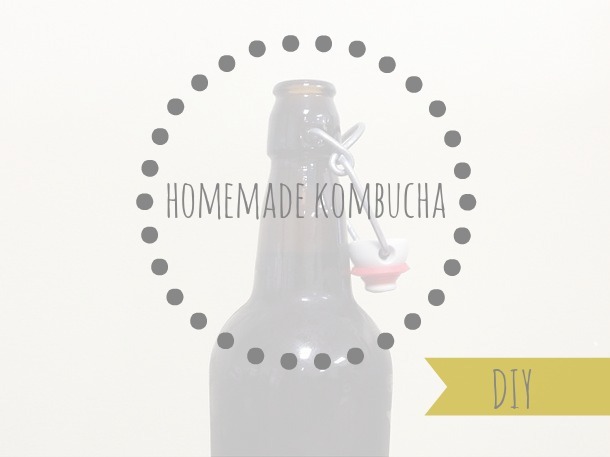 It’s what I started with, and if you follow these simple instructions, I think you can have a never-ending supply of delicious kombucha right at your fingertips. Boil 3 cups of your water in a small, stainless steel saucepan. Add sugar and stir to dissolve. Next toss in your tea bags and let steep about 10 minutes. Cool completely. Pour tea into your container of choice, preferably glass, and add the remaining 10 cups of water. Next add your kombucha from a previous batch (or store-bought). Place your scoby on top (it might sink to the bottom and that’s ok). Cover with a paper towel, cheesecloth, or coffee filter (something breathable) and secure with a rubber band. Let sit 7-14 days (I prefer to let mine go a full 14) out of direct sunlight. After about 7 days, start checking to see if your kombucha is ready. Taste it! It should be slightly fizzy and a good balance of sweet and sour (I like mine more sour than sweet. Find what works for you!). With clean hands, remove the scoby and 1 1/2 cups of the brewed kombucha. Place it in a small bowl and set aside for your next batch. Pour your kombucha into bottles (I use these and 1 batch fills about 6 bottles), straining if desired, making sure to leave a small pocket of air at the top of the bottle, which allows the kombucha to further ferment and carbonate. If you want to flavor your kombucha, now is the time. My favorite is ginger so I like to add 1-2 tbsp fresh pressed ginger juice, but you can also add other fresh fruit juices, pieces of fruit, or even crystallized ginger. Be sure to cap tightly. Let sit for 3 days at room temperature, and then refrigerate for storage. Start again! When starting out with probiotics or fermented foods, start slow. If your gut is imbalanced, there could be a die off of the bad bacteria, which can lead to cramping, gas, and even diarrhea. If you start out with small amounts of probiotic rich foods, you should be able to avoid these symptoms. Your scoby may not float to the top, that’s ok.
With each batch, a new scoby with form. It should be cream-colored, not green or black-which would indicate mold, in which case you should throw it out and start again. There will probably be brown stringy bits hanging down from your scoby and sediment at the bottom of the container. These are all normal signs of fermentation. Start a scoby hotel so you can share with friends or have a backup if something happens to yours. Peel off extra scoby layers and place them in a glass jar full of kombucha. Cap and put in a cool, dark place until needed. Don’t let your kombucha have prolonged contact with metal. It can alter the taste and weaken the scoby. Have fun and experiment with flavors. Share the love! I have never heard of kombucha but after reading this ill deffintley give it a go! I eat sauerkraut regularly with my meal, I find it helps well with my digestion. I also like to pickle different veggies using a press. Look forward to giving this a go! I would love to hear what you think if you try it. I love sauerkraut, too, it’s definitely one of my favorite fermented foods! Yay for good bacteria! What do you say we swap a sourdough culture for a scoby next month?? : ) I want to get back in the kombucha game. Interesting! I’ve never had this before, but recently saw some stuff online about fermented food and stomach health. As a UC sufferer, you’ve got my attention! It’s so good! Let me know if you give it a try. And you’re right, most don’t know how important gut health is, but it makes a big difference in so many areas of your health!